The NRC staff has now completed its safety evaluation report (SER) on the proposed nuclear waste repository at Yucca Mountain in Nevada, with the publication of Volume 2 and Volume 5. This is an important milestone – however, completion of the SER neither finishes the review process nor represents a licensing decision. To recap: The NRC closed its review of the application in fiscal year 2011. (The full story is here.) The NRC staff published Volume 1 of its five-volume SER in August 2010. Volume 1 covered general information about the application. The NRC staff subsequently published three technical evaluation reports to capture the work it had already done on volumes 2, 3 and 4, though without any regulatory conclusions. In August 2013, the U.S. Court of Appeals for the District of Columbia Circuit ordered the NRC to resume the licensing process using leftover money appropriated from the Nuclear Waste Fund. So the agency resumed its work on the formal safety evaluation report. We published Volume 3, covering repository safety after permanent closure, in October 2013. Volume 4, on administrative and programmatic requirements, was published in December. Volume 2, repository safety before permanent closure, and Volume 5, license specifications, complete the SER and the technical part of the licensing review. That technical review concluded DOE’s application meets the safety and regulatory requirements in NRC’s regulations, except for DOE’s failure to secure certain land and water rights needed for construction and operation of the repository. These issues were identified in Volume 4. Bottom line: the SER recommends that the Commission should not issue a construction authorization until DOE secures those land and water rights, and a supplement to DOE’s environmental impact statement (EIS) is completed. The land DOE still needs to acquire is owned by three federal agencies: DOE’s National Nuclear Security Administration, the Department of the Interior and the Department of Defense. Legislation was introduced in Congress in 2007 to appropriate the land for the repository, but it did not pass. The water rights DOE needs are owned by the state of Nevada, which refused to appropriate the water in 1997. Litigation challenging that refusal is stayed. When the NRC resumed its licensing review in response to the appeals court, the agency asked DOE to supplement the EIS to cover certain groundwater-related issues. DOE declined to do so. The NRC staff is prepared to develop the supplement if the Commission tells it to. Even if the EIS is completed, two more steps are needed before a licensing decision can be made. The adjudication of nearly 300 contentions filed by Nevada and other parties challenging the repository was also suspended in 2011. Reviving and completing this hearing will require more funding from Congress. Finally, the Commission must review issues outside of the adjudicatory context. Only then would the Commission decide whether to authorize construction. So yes, completion of the SER is a major step, but there are many more ahead before the NRC can say yea or nay to Yucca Mountain. Well, i just think its silly to bury something so toxic yet has all that radioactive stuff going on instead of recycling it …. and I’m not talking about stupid recycling it, doing it the right way with something we’ve never had before: Real Nuclear Waste Confidence. This is a great puzzle and we need to focus on that goal as a necessary element or we will be #fuqafukushimied back into the infinity pool of species that lost the earth game. There was an NRC research program on the safety of geologically disposed high-level radioactive waste that ran for about 20 years. It ended in early 1996 because of severe budget cuts. There was no NRC research on the development of safe-disposal or above-ground-storage technologies. That job would likely be done, and has been done, by the Department of Energy. DOE considered alternatives to geologic disposal, e.g. sub-seabed disposal and disposal into space. 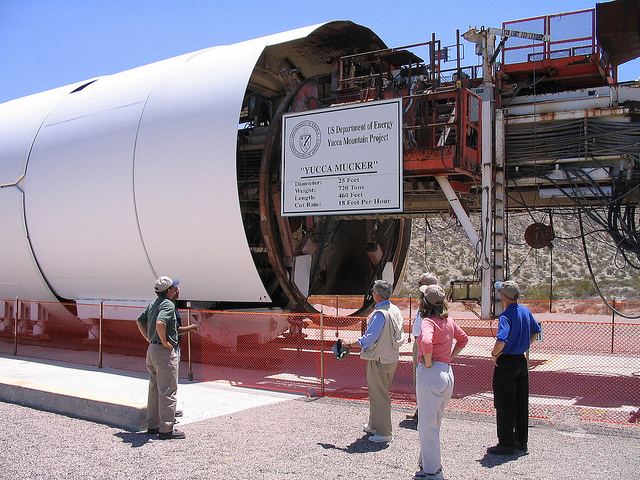 Using Yucca Mountain in Nevada as a central repository for the byproducts of nuclear power generation in the United States is not a perfect solution to a complex problem, but it’s far better than the status quo. Congress should lay politics aside and move forward. OK Marcel, let’s put this high level stuff in your backyard until we can reprocess all the goody therein! There’s no logical reason to simply throw away valuable spent fuel in some Nevada repository. Spent fuel is a precious energy commodity owned by the American people that Bill Gates says is worth over $100 trillion in clean carbon neutral electricity in next generation reactors. If we’re going to save our coastlines from rising sea levels for future generations, we’re going to need to start recycling spent fuel in current and next generation reactors. Make use of our Military Testing Bases and or our MOA’s (Military Operation Area’s) out west, which are really huge tracts of land (think tens of thousands of acres) used ONLY by the military and already secured by them 24/7! Because these casks would be very large and all look alike nobody would know what was in any one of them, which would be yet another level of security for the casks containing even higher levels of nuclear waste! An ideal outside coating for these casks would be similar to the spray-on “bed liner” used for pickup trucks that not only prevents rusting and or damage for the life of the vehicle but would also seal the casks to prevent leakage of any kind! Hopefully these casts would be similar in size to a large shipping container so that existing material handling equipment could be used to load, unload and or move them about without “inventing” a mega hauler vehicle. By keeping the “footprint” of these casks similar to a large 40 foot container, the stacking and or placement of them might also be semi or fully automated which would not only save money but again keep the exact location of any specific cask secret! The monitoring of these casks 24/7/365 could even be done via satellite since these casks are similar in size to rocket launchers which are easily seen from space. * The Space Elevator Project (LiftPort) http://liftport.com/ is something that the NRC should help fund ASAP, because it represents the best way to actually eliminate storing nuclear waste on Earth! Bottom line is this country does not have the will to do the right thing unless a tragedy occurs, just like 9/11. Allowing this high level nuclear waste to pile up all over our country, much of it near population centers, is downright criminal. Nothing will be done about it until one of our nation’s nuclear sites is hit by terrorists. 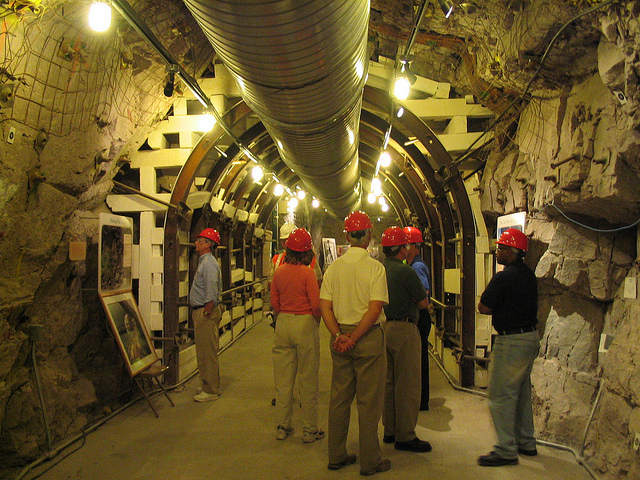 The Nuclear Regulatory Commission must request money from Congress to complete its work on Yucca Mountain. Admittedly it is a tough job to deal with 300 contentions but I have no reason to believe that any other state selected for a repository site would not come up with numerous contentions. When Mississippi’s Richton Dome was being considered a Mississippian said “You would think it was the Second Comming”. Senator Trent Lott defined a population density requirement that excluded not only the county in which the Richton Dome is located but all other counties in the U. S. I would also suggest that most other states can afford more lawyers and have more effective environmental groups than Nevada. I think we have to bite the bullet with Nevada and deal with their conditions. Many decisions will set precedents for other subsequent decisions for repositories in other states. As any successful parent knows you cannot let a child who throws a tantrum succeed. Hmmmm …. Three federal agencies?! Throw more money into this or give industry a shot at it instead? What if we build one of those nuclear material reclaimation plants out here in the California desert while we let the yucca mountain players figure itself out? I just wish we hadn’t gone this far without a real solution. What WERE our parents thinking? It’s really important. 500 word exception.